Sermon preached on Romans 12:9-21 by Rev. 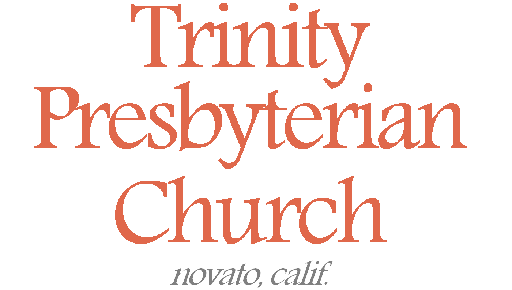 W. Reid Hankins during the Morning Service at Trinity Presbyterian Church (OPC) on 3/17/2013 in Novato, CA. And so let’s begin then with some definitions. Let’s define what is good and therefore in contrast what is evil. This starts us out then with some systematic theology. In other words, if we are to love the good and hate the evil, we need to know which is which. Well, the Bible tells us what is truly good. Three things stand out from the Scriptures about what makes something truly good. First, a good thing has to be according to the right standard, that is, the law of God. The law reveals to us what is right and wrong, like how it says in Romans 7:7 that we wouldn’t know about the sin of coveting, if the law hadn’t said, you shall not covet. Second, a good thing needs to be according to the right motive, that is, done out of true faith. Romans 14:23 says that whatever is not from faith is sin. In other words, you need to really believe that the thing is good. If you don’t believe it’s good, then you shouldn’t love it, even if it really was a good thing. That would be wrong for you because you thought it to be not good. Third, a good thing needs to be done for the right goal and purpose, that is, to glorify God. 1 Corinthians 10:31 says that in whatever you do, do all to the glory of God. In other words, a good thing needs to be done ultimately to please God and in service and praise to him. And so, these three things make something good: That it’s according to the right standard, the right motive, and right goal. Well then, let’s further define this standard. If we are going to love and cling to the good and hate and abhor the evil, then we want to be experts in the good. That means’s God’s standard must be understood and studied. Well, we said the standard is God’s law. I’m talking here about God’s moral laws that we find in the Scriptures. His moral laws are throughout the Scriptures. We especially note that the Ten Commandments are a summary of these moral laws. Those Ten Commandments are listed in both Exodus 20 and Deuteronomy 5. In Romans 2 we find that this moral law is also written upon people heart’s. In theological terms, we refer to this as the natural law. Of course, man in his sinful nature, doesn’t always recognize this law written on their hearts, as he should. But that’s the beauty in God having also revealed his law in the Holy Scripture. Scripture also further summarizes the law for us into two main parts. Jesus said the greatest commandment is to love the Lord your God with all your heart, soul, mind, and strength (Mark 12:30). And he said the second greatest commandment is to love your neighbor as yourself (Mark 12:31). Jesus talked about the second commandment as well in what we call the golden rule. He taught us to do unto others as we would have them to do unto us (Luke 6:31). These two commandments are a summary of all the commandments, according to Jesus. In other words, we can think about our obligations toward God and our obligations toward other humans. We can think of the call to love all, with unique ways that is realized in how we interact with God versus man. Let me mention one more aspect of God’s standard on what is good. When we think about the law of God, doing good and not evil means we need to not commit the evil and instead to do the good. We often explain this in terms of the concepts of commission and omission. We can sin by doing evil in both of these; in both commission and omission. In other words, we do evil when we explicitly commit something that the Bible tells us not to do. Similarly, we also do evil, when we omit to do something that the Bible tells us we should be doing. Sins of commission and omission are both an evil. The good is to avoid transgressing the laws of God and instead to do all that’s required of us in the Word. As Christians who have been born again by the Holy Spirit we have the ability to pursue that which is truly good. We won’t achieve this perfectly before we go to be with the Lord. But we are commanded to pursue the good and to grow in it. That is where we will now turn to in our message today. We talked about how we know what is good and what is evil. Now, let’s consider how we’ve been called to abhor the evil, and to cling to the good. This is the exhortation here, right? In our first point, we talked systematic theology. We defined good and evil. That’s all well and good. But here’s what we’re really talking about. Here’s the application. The command. That evil we talked about: abhor it. That good we talked about: cling to it. Those are some pretty powerful commands. We are probably used to saying love the good and hate the evil. But to abhor the evil; to cling to the good. That’s powerful language. Let’s briefly consider each. To abhor something is not just to hate it. It’s to strongly hate it. You loathe it. You are repulsed by it. You have a strong desire to avoid it and stay away from it. That’s what we are supposed to do with the evil. It should disgust us. That’s why when we do commit a sin we say that part of our response to that sin should be godly sorrow. That you really mourn over the fact that you got involved again in such filth. This is a good way to examine your heart and you sanctification. Pick some particular sin you’ve struggled with. Do you just mentally reject that evil? Like you know in your head it is wrong. Or do you truly abhor it? God calls us to truly abhor that which is evil. An interesting example of this is in Revelations 2:6. That’s the place in the book of Revelation where the seven letters are being sent to the seven churches. That particular spot is in the letter to the church at Ephesus. In that letter, Jesus had just rebuked them for having left their first love. In other words, they in general hadn’t been loving what they should have been loving. But the letter goes on in 2:6 to commend them for one thing. For their hatred of an evil. Jesus says to them in Revelation 2:6 “But this you have, that you hate the deeds of the Nicolaitans, which I also hate.” And so even though their love wasn’t what it should be, there was a hatred for the evil heretical movement of the Nicolaitans. Jesus said that was a good thing for them. It’s a good to really hate the evil. What evils are we tempted to love but really need to be hating? To be abhoring? This is a question for us each to ask our heart. Again, make sure you’ve not deceived yourself. It’s not just that you think the evil is wrong. But have you actually abhorred it? If not, confess that to God, and seek to turn from that wrong inclination of your heart. Ask for God to be changing your heart to truly hate that which is evil. This self-examination of our hearts is so important because the world is going to try to get you to do the opposite. The world is going to try to present you the beauty of some evil. Think of advertising. When someone tries to sell you something, they usually appeal not just to the logic of owning that item. They try to get you truly enamored with the item. The world will do that with evil. That’s what Satan did in the garden with Eve. He got her to suddenly find that fruit attractive. And so she ate it. No! Let us realize the world and Satan will hit us hard here. Let us look to abhor the evil! So that’s about abhorring the evil. Let’s think about clinging to the good then. The word here in the Greek is about being glued together. It’s about being joined closely. It’s a very colorful word. It can be used in a broad way. Scripture sometimes uses it to describe the joining of a man and woman in marital intimacy. It also uses it to describe joining with other disciples in their teaching. So, it’s a word with some broad usage. But the idea is simply that you are sticking with something. It’s about making a total commitment to something. And so that is what we are to do with the good. We should lock arms with the good. We should be joined at the hip with the good. We should embrace the good in a big bear hug and never let go. At one point Jesus’ disciples said they had left everything to follow Jesus. That’s similar to this idea of clinging to the good. It’s saying we are going to stick by the good. That means we don’t stand by the evil any longer. No, we’ve chosen sides and we will be loyal to the good. Yes, as we mentioned before, we won’t do this perfectly this side of heaven. But this is direction where our heart is to head. Toward faithfulness to the good, and forsaking of the evil. with its cravings for evil. We are to put on Christ and his love for all things good. It’s about putting to death what is earthly in us, and to live instead in that new life from above. To say it another way, we are simply talking about what a life of repentance looks like. Repentance means we mourn over our previous evils. We not only confess them to be evil, but begin to truly hate them. We have a mental U-turn that says I’m going to look to now cling to the good. This is basic to our Christian faith. To reject the evil and embrace the good. And yet, as basic as it is to our Christian faith, we realize how good grace is as soon as we think about this. Because it’s like we said last week. This has been our struggle all our life. Scripture testifies to this struggle. The prophet Micah in Micah 3:1 condemned the leaders among Israel and Judah for this very problem. That they hated good and loved evil. Jesus talked about the difficulty we have wanting to love both good and evil — he said it like this — we can’t serve two masters! We will either hate the one and love the other, or be loyal to the one and despise the other. This has been our struggle. To only love the good and to always hate the evil. Yet, this is where we realize how good grace is. There is grace and forgiveness even for this. God knows this is our struggle. Christ died on the cross for all our sins of hating the good and loving the evil. The guilt of all that has been paid for. You receive that forgiveness by faith. But he doesn’t just leave you forgiven. No, he now is working this love for the good and the hatred for the evil in you. Yes, you’ll find the struggle. But be encouraged when you see the struggle. Why would you really struggle like that — unless God is at work? Be concerned if you don’t find a struggle. If at any point you think you have mastered the good and completely stopped the evil — if you ever think you have gotten to that point, then be concerned for sure! You see, the struggle reflects God’s work in you. This is your sanctification underway. This is grace at work. Praise God that as we look to abhor the evil and cling to the good, he’s at work through it all. To cultivate in us by his grace, godly affections. Well, in our final point for today, I want us to think of a practical example where we can put this into place. It’s the example seen here, particularly in verses 14-21. It’s about showing good to people who show you evil. It’s about clinging to the good when enemies love to treat you with evil. This is some practical application given by Paul. And isn’t this where the rubber meets the road? Verse 17 is pretty plain. Don’t repay evil for evil. You know, that would be the worldly way to handle this. Remember 12:2 said to not be conformed to the world, but be transformed by the renewing of your mind. This is some renewed way of thinking, isn’t it? The world might say something like: if you are mean to me, then I’ll be mean back to you. It might be a sort of perverted sense of an eye for an eye and a tooth for a tooth. The world’s way of taking the higher ground might be something like, if you are mean to me, then I just won’t have anything to do with you anymore. But this passage challenges us to go beyond that. It’s like Jesus said, turn the other cheek. Go the extra mile. Don’t just not do evil back to them. Actually look to do good to them in return. As it says in verse 20, if your enemy is hungry, feed him. If he is thirsty, give him something to drink. Don’t repay evil with evil. Don’t even repay it with neutrality. Repay it with good! Give it what it didn’t deserve! That’s the best thing we can do. I like how verse 17 describes this good that we are to do in such a situation. It says we are to have regard for the good things in the sight of all men. We mentioned the natural law earlier. The basics of morality are something that everyone can recognize. And so this passage acknowledges that when someone does something bad to you, likely others will see what’s going on. Your response of good for their evil will usually be witnessed by others as well. Keep that in mind as well. Be intentional in how you respond to other’s evil. Keep in mind how to show your good even in front of a watching world. Three related results can come from all this. One, you can vindicate yourself before the other person who is persecuting you. If they show you evil, and you respond with good, what fuel will they have for their accusations? It’s like what Peter says in 1 Peter 3:16. He essentially says to do good to people who treat you with evil, so “that when they defame you as evildoers, those who revile your good conduct in Christ may be ashamed.” If we keep doing what is good to them when they do what is bad to us, it can serve to vindicate you, even in their eyes. A second result of all this is that it can result in the relationship being healed. Verse 20 says that your kindness to them can be like hot coals being poured on their head. The analogy is that it actually hurts them when you are so good to them. So good to them when they have been so bad to you. The hurt for them is that of shame. They can be shamed into being reconciled with you. And so it’s like what it says in verse 18, as much as it depends upon you, live peaceably with all men. You can’t force the other person to be reconciled with you. But you can do everything in your power to try to make that happen. And at the heart of your response is you doing good to them. A third result of all this is that you can be a witness to the watching world around you. Jesus said in the Sermon on the Mount to let your light so shine before men so that they may see your good works and glorify your father who is in heaven. Peter said a similar thing in 1 Peter 2:12, telling us to have good conduct among the unbelieving nations, that when they speak against you as evildoers, that by your good works which they say, may glorify God on the day of Christ’s return. And so it’s as the passage ends. Do not be overcome by evil, but overcome evil with good. You see, this is all part of this age-old war of good versus evil. How we treat people who treat us with evil, is part of that battle. At the end of the day, are we going to treat such people as the world would? Or as God would? Well, you’ve been called to be a son of God. And so you must treat them the way God would. You must give the good even to the people who give you the evil. Because that is what God has done for you. That is what God did in your own life through his Son Jesus Christ. God has overcome and is overcoming the evil in your life by showing you goodness and kindness. While we were yet sinners, Christ died for us. When we were yet opposed to him, his enemies, he loved us. This is what a son of God does, because it’s what God has done for us. We have the opportunity to really live like Christ to the world. And in all this, we participate in this larger battle between good and evil. Brothers and sisters, good will triumph over evil. We know that because we’ve seen it already begin to happen in our lives. In how we’ve become saved. Good will triumph over evil. Either as it overcomes a sinners heart unto repentance. Or when God pours out divine wrath in judgment on those who persist in loving evil. That is what we have been saved from, when we have become a Christian. God’s goodness overcame our hard hearts, turning us toward his love and forgiveness and grace. His goodness broke our evil. He overcame and is overcoming our evil with his goodness in Christ. And so as those who’ve experienced how good can overcome evil, let us go and do likewise. Trust God in this. Trust that even when you do good to people who do evil, that’s okay. It may not seem fair to you. But trust that God overcomes evil with good. That God will have the final say. That God and good will have the victory. Amen.